I seem to be doing a lot of posts on squares and parks recently. I guess it comes from the lack of parades and my inveterate cheapness. 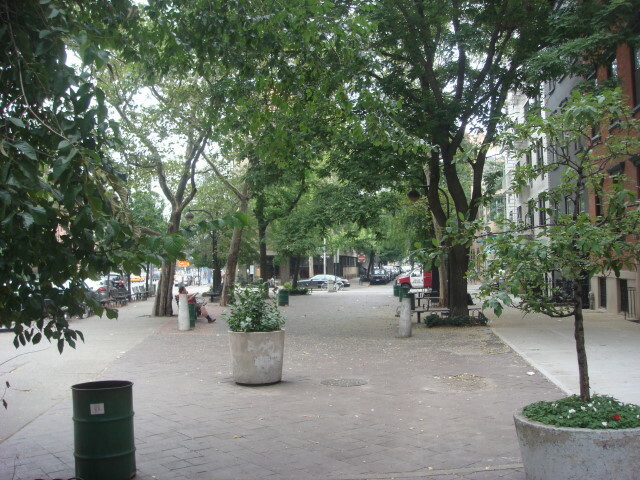 Parks and squares are free to visit. When I first spotted Father Fagan Park in SoHo, all I could think of was Fagin from Oliver Twist. That’s unfair to Father Fagan himself. He died in 1938 in a fire after saving two of his friends. As parks go, this is one of the least “green” that I am aware of. It has some trees, but not many. I don’t think there’s a blade of grass on it. It’s all paved over. 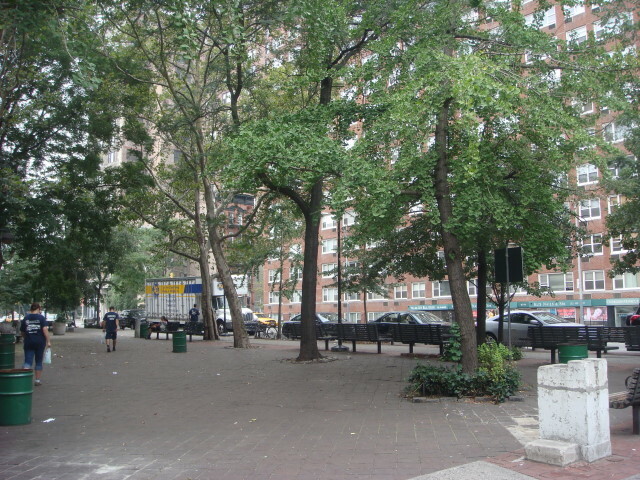 The park is located at 6th Avenue and Prince Street, very close to the SoHo subway station. There’s a nice little bodega right there. I went in, but it was jammed so I left for less popular climes. I’m so predictable in this next item: like virtually all NYC parks, it has lots of seating. Of course sitting next to busy 6th Avenue isn’t something I’d do to relax. This entry was posted on August 7, 2008 at 6:37 pm and is filed under Manhattan, SoHo, Wanderings. You can subscribe via RSS 2.0 feed to this post's comments. You can comment below, or link to this permanent URL from your own site. Thanks I’ve been searching for pictures of this park as in doing my family genealogy I discovered I am related to Father Fagan. I would be thrilled if I could obtain a few more pics of the park and also a picture of Father Fagan himself.